Will Elsevier accidentally unite the open access movement? We open access advocates are unanimous in the goal of universal open access to the world's scholarly knowledge (at least in its peer-reviewed journal article form, for now). However, at times we differ about the means. Some of us favor a focus on rapid transition to a fully open access, more efficient and effective scholarly communication system - what some call the gold road of open access publishing, and Harnad refers to as the premature gold rush. Others, like Harnad himself, favor beginning with the traditional scholarly publishing system as it is, with authors self-archiving in open access archives to expand open access beyond what is provided by library subscriptions. (I fully agree with both positions!). So what does this have to do with Elsevier? Simple: Elsevier is "green" on open access and hence the darling of the green roaders. As long as Elsevier supports this approach, the open access archives first supporters are likely to support Elsevier. However, as we saw recently with the Research Works Act, Elsevier is quite capable of doing its best to attack the open access mandates that are critical to the green road. If Elsevier keeps up this attack on open access mandates, it's a matter of time the green roaders become gold and join us in the Elsevier boycott - where they will be most welcome! So what are the options for Elsevier? They can either support - or at least not attack - the open access mandates that are coming, particularly the U.S.' FRPAA and the growing institutional open access mandates movement, and keep the support of the green roaders - or they can attack the mandates, and face a much more united open access movement. I think that this is what people like to call "between a rock and a hard place". Of course, Elsevier could follow the lead of other major commercial scholarly publishers such as Springer, Wiley, Nature Publishing Group, and others, and aim to compete in the obviously emerging open access marketplace. This growing tendency towards OA competition is a topic that I speak to in a bit more depth in the 4th chapter of my draft dissertation, open access as solution to the enclosure of knowledge. Elsevier numbers illustrate - once again - just how much more sense open access makes! Elsevier today wrote a letter to the mathematics community, hoping to woo scholars away from the still-growing boycott, The Cost of Knowledge, now that Elsevier has publicly disavowed its support for the Research Works Act which would have forbidden the U.S. government from requiring public access to the results of research it pays for. In its letter, Elsevier commits to lowering the costs of articles in its mathematics journals to at or below $11 US per article. This sounds like a pretty reasonable step when you consider that this is just over a quarter of what Elsevier currently charges. However, when you compare this with the potential of open access, you can see how ludicrous this model really is today. If every research library in North America were to purchase a copy of an Elsevier article at $11, this would add up to $1,386 - more than it would cost to pay the PLoS ONE article processing fee for full open access to everyone, everywhere. Or, if an undergrad class of 150 students were required to purchase this article to read for class on a pay-per-use basis, the total would come to $1,650 - that's $300 more than what is needed to pay for the article to be fully open access through PLoS ONE - for access to just one class. In summary, this move by Elsevier just shows how ludicrous the current model is. Plus - why just math, Elsevier? There are many of us who signed the boycott who are not mathematicians! In the section on pricing, Elsevier commits to lowering the costs of articles in its mathematical journals to at or below $11 US per article or 50-60 cents per page. As a for-profit corporation reporting to shareholders, I think it is reasonable to assume that Elsevier would not make such a commitment unless this cost was sufficient to not only cover costs, but return a profit. Does this mean that the current $37.95 charged for one article in Elsevier's Advances in Applied Mathematics is close to 4 times more than what Elsevier itself feels is necessary to recoup costs and make a profit? This does seem consistent with Elsevier's high profit rates. If every one of the 126 members of the Association of Research Libraries were to pay $11 for an article in mathematics, the total would be $1,386. That's higher than the article processing fee for a fully open access article at PLoS ONE at $1,350 per article. In other words, a high quality, U.S.-based publisher working out of San Francisco (not a cheap place to live or work, I hear), can provide full open access for everyone in the world at less than it would cost to have one copy of an article at every large North American research library, at Elsevier's proposed reduced rate which is just over a quarter of what they currently charge. This is yet more proof that this old school business model of Elsevier's just doesn't make any sense any more, not even with this little modicum of tweaking after significant pressure from mathematicians like Timothy Gowers. Another scenario: if an undergrad class of 150 students were required to buy a $11 mathematics article to read for class on a pay-to-read basis, the cost would be $1,650. In other words, the pay-per-view costs for just one class to read an article would exceed the PLoS ONE article processing fee by $300. Multiply that by all the millions of students in the world, and it's easy to see how the Elsevier model means either outrageous costs or needless barriers to mathematical knowledge, or, more likely (as things stand now) some of both. Mathematics journals published by Elsevier tend to be larger than those of other publishers. On a price-per-article, or price-per-page level, our prices are typically, but not always, lower than those of other mathematics publishers. Our target is for all of our core mathematics titles to be priced at or below US$11 per article (equivalent to 50-60 cents per normal typeset page) by next year, placing us below most University presses, some societies and other commercial competitors. Where journals are more expensive than this, we will lower our prices, as we already have in recent years for journals such as the Journal of Algebra and Topology and its Applications, among others. We realize that this is just part of the concerns about pricing -and we will seek to address concerns about the nature and composition of the large discounted agreements, through which most Universities now access journals - but addressing the base line pricing is a necessary first step. Elsevier, the scholarly publisher currently being boycotted by close to 7,000 researchers, does not appear on the exclusions list of the copyright extremist group Access Copyright. To me, this raises the question: are Elsevier and ilk receiving monies from Access Copyright in addition to the substantial fees paid by libraries for subscriptions, and if so, is this a breach of the typical "entire agreement" clause in a library license? Since Access Copyright does not tell us who they are giving money to, why not ask when we purchase? We could call this an "open disclosure" policy. Whenever libraries are purchasing or subscribing to resources, let's ask - IS this really the entire agreement, or are you looking for money from copyright collectives, too? buying their stuff if we must, but putting it away in the most dark, remote corner we can find, in a separate room covered with stern warnings like: "These materials are covered by Access Copyright". Don't even THINK about copying! Another thought: if Access Copyright and those represented by Access Copyright don't want to participate in open disclosure, then let's start by encouraging those who aren't members of Access Copyright to openly proclaim their non-membership. This could be a selling point! Come of think of it, I wonder if anyone is using that Access Copyright exclusions list as an acquisitions tool? Could the University of Iowa Libraries save over $2 million from their subscriptions budget with a flip to open access? 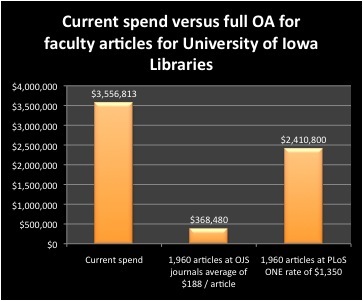 Thanks to Wendy Robertson at the University of Iowa Libraries for posting some very useful information about their library's expenditures on journals. This post is an informal research collaboration designed to build on Robertson's work, explore the cost of a full flip to open access for this particular university and some of other not yet quantified possibilities that may be of interest along with a flip to open access. By my calculations, the University of Iowa Libraries could save over $2 million dollars or 60% of the expenditures for journals listed on this web page with a full flip to open access, paid for entirely out of the library budget, assuming a mixed model composed of half of the articles published in the scholar-led publishing sector as illustrated by OJS (Edgar & Willinsky), with an average per-article cost of $188; and the other half published using an article processing fee with the PLoS ONE fee of $1,350 as an average. It is assumed that 1,960 articles were published by the University of Iowa Libraries in 2010, based on a Google Scholar Advanced Search. More information would be most helpful to refine my calculations. In particular, it would be really helpful to have a better estimate of the number of journal articles published by the University of Iowa faculty in a given year. If anyone has data to help with this project, please share! In order to facilitate this sharing, I plan to turn on the comment feature on my blog. For calculations, download the data. Method note: the reason I used the 2008 google scholar article numbers is because this was the highest count in recent, i.e. to obtain a conservative figure. I argue that we need to look for savings in the process of transition to open access, because libraries have many new areas where funding is needed, such as services to support research data, preserving electronic information, research commons type services and embedded librarianship. One of the reasons why the scholar-led publishers that are the primary users of Open Journal Systems have such a low per-average article cost is that many are built on efficient, not-for-profit library publishing services. Perhaps the transition to full open access will open up opportunities for our librarian colleagues? For example, I hear that there are (understandably) many concerns about potential layoffs at Harvard's libraries. Getting into publishing could be a great freelance opportunity for some of these highly qualified people - after all, who better to help libraries make the transition to OA than our own professional colleagues? Or, I wonder if Harvard has considered that this might be a good time to grow their own publishing services? Then they could simply transition acquisitions budgets into funding for new opportunities to retain their own great staff. Speaking of job opportunities, growth in the not-for-profit publishing sector could open up many a part-time or full-time opportunity for some of our faculty members, too - no doubt this would be very welcome considering the impact of the financial crisis on university professors. I wonder if even those who have secure jobs themselves might like the idea of transitioning high profits for commercial publishers into more and/or better job opportunities for their colleagues and graduating students? We could spend a lot more than that average $188 per article and still save a bundle, too! For more of my writing on the economics of scholarly communication in transition to open access, please see this draft chapter of my open thesis. A way of saying "this is open access"
In honour of the 10th anniversary of the Budapest Open Access Initiative (February 14), here is a way of saying "this is open access" based on BOAI. I am hoping that this kind of approach can lend clarity and avoid some of the complexities that come with Creative Commons licensing. In brief, the basic idea is to make a statement that a work is made open access in accord with the definition and the spirit of the Budapest Open Access Initiative. People can link to BOAI, or copy the text; and add specific permissions if these apply. This blog is open access in the definition and spirit of the Budapest Open Access Initiative. Note that sometimes I copy bits from other peoples' works, so please watch for this as my permissions apply only to my own work. What the definition and spirit of BOAI means to me is that you are free to take my work and reuse it, with attribution, as long as you make any copies or derivatives freely available and with the caveat that you may not sell my work, or place it behind a paywall. This statement does not (yet) replace my CC-BY-NC-SA license for IJPE, but is rather presented as one idea to help in the struggle to Articulate the Commons. Comments are welcome - join me in Google G+ for discussion. PLoS ONE is in the lead...but could a well thought out noncommercial approach give a competitor an edge? PLoS ONE has often been the source of attention on IJPE and elsewhere, becoming in 2010 the world's largest journal then doubling in size in 2011, publishing close to 14,000 articles that year. No wonder PLoS ONE is leading the new tendency to competition in open access, attracting a number of clones. No doubt many a competitor is wondering how they'll ever get a edge when PLoS ONE is so far ahead - that's my guess as to why Mary Anne Liebert is starting out by providing free publishing services. So here is a thought - could a well thought out noncommercial approach give a publisher an edge over PLoS ONE, with its insistence that all authors accept the CC-BY license? There just might be something to this. My own perspective is that as an open access advocate of course I want to freely share my work - but not for sale! My preference for including the noncommercial element in a CC license is by no means unusual - my understanding is that NC is the most popular of the CC elements. I've even been thinking that when I next get around to doing some writing to submit for publication, I just might go for Nature's Scientific Reports rather than PLoS ONE - much as I like PLoS and PLoS ONE, Nature will let me have my preferred NC license, and PLoS ONE won't. When we scholars come up with our own open access mandates, sharing our work, "but not for a profit" is part of the deal, as illustrated by the leader with this approach, Harvard, and MIT. This kind of suggests that scholars don't want to give away their work to just anyone to sell for a profit, doesn't it? So what would a good noncommercial policy look like? First of all, if authors are paying to make their work open access, then it should be open access, and the copyright (including any reserved commercial rights) should belong to the author. This would protect the publisher from having a competitor take their whole journal and use it for commercial purposes that would undermine the working publisher's revenue streams, while making it clear to authors and funders alike that the purpose is not to sneak in other enclosures for the purpose of making more profits. This is a concept I am just starting to explore. Comments are welcome, via email at hgmorris at sfu dot ca. This post is part of the Articulating the Commons series. Mary Anne Liebert has just announced their entry into the open access megajournal competition with Bioresearch Open Access on a loss leader (no article processing fees - yet) basis. My comments, in brief: this development is most welcome, as yet another example that open access has moved into a competitive phase for the commercial sector. Commentary on the APF will have to wait until one is announced, but note that anything above $1,300 U.S. will not be competitive with existing options such as Nature's Scientific Reports and PLoS ONE. It is hard to assess the terms based on the description from the announcement. My advice to Liebert is to use a CC license, leave copyright with the author, and clarify what "noncommercial" means as the current CC NC terms are much too broad. My recommendation is to limit noncommercial to no resale and clearly state that there is no intention of limiting educational use. BioResearch Open Access is a journal of broad interest that has been launched to overcome unnecessary barriers to the immediate availability and use of research. BioResearch Open Access makes all content freely available to researchers worldwide. There will be no article processing fees for articles submitted prior to May 15, 2012. Article processing fees to cover the cost of publication may be announced after May 15, 2012. All articles in the Journal will be deposited upon publication, without embargo, to PubMed Central. BioResearch Open Access is fully NIH-, HHMI-, and Wellcome Trust-compliant. Welcome to Mary Anne Liebert and Bioresearch Open Access - yet another example that open access has moved into a competitive phase for the commercial sector. Comment on the article processing fee will have to wait until this is announced, but note that anything above $1,300 U.S. would not be competitive with similar services such as Nature's Scientific Reports and PLoS ONE. The default $3,200 optional open access fee for other Liebert journals suggests that this publisher has yet to take OA competition seriously. This article processing fee is nearly double the BioMedCentral standard fee of $1,895 U.S., for example, and six times the article processing fees for many of the journals published by the profitable Hindawi Publishing Company. 1. Who retains copyright? (My advice: with open access, the author should retain copyright). 2. Will a CC license be used, and if so, which one? Presumably NC, but this is not totally clear. 3. If Liebert is not planning to grant blanket commercial rights, what does this mean, exactly? Note that I fully support the CC Noncommercial license, providing that the intent is limited to prohibiting resale and that it is clear that educational use is not considered commercial. Unfortunately, this is not clear with the CC Version 3.0 licenses - I hope that this will be corrected for Version 4.0, but in the meantime clarification is necessary. The language that I use for this for IJPE http://poeticeconomics.blogspot.com/2011/12/education-is-public-good-not-commercial.html is available to anyone for this purpose on a public-domain basis (tweak as you like, citation optional). Thanks to Daniel Mietchen for the head's-up. At a recent meeting of the American Economic Association, the AEA began tackling some important ethical issues, according to this article in The Economist. Economics has internalised the views of rich patrons, according to Luigi Zingales of the University of Chicago. His scathing analysis of journal publications revealed that papers providing justification for high executive pay were 55% more likely to be published than those opposed, and were more heavily cited by others. A paper presented by Atif Mian of the University of California, Berkeley, Amir Sufi of the University of Chicago and Francesco Trebbi of the University of British Columbia, laid out why good policy is often most difficult to implement in the wake of a financial crisis...a redistribution of wealth from creditors to debtors could potentially benefit both groups by averting a deep downturn. Yet even though debtors are many, such redistributions are few. Effective lobbying by a few, concentrated creditors helps hold back a populist tide: a few powerful banks, for instance, may be better able to influence legislators than millions of homeowners. Comment: this is very interesting, and lends support to something I am thinking about but have not yet written about, which is that the current situation of extreme and growing inequity is not good for anyone, not even the 1%. For example, what good will extreme wealth do for the 1% when everyone's favorite island nation getaways are under water due to global warming? If we continue on our current path of destroying our precious water supplies through using increasingly dangerous methods of obtaining oil and gas such as hydraulic fracturing or putting pipelines to carry oil sands oil - with leaking inevitable - right through key watersheds as per the first Keystone Pipeline proposal - it is only a matter of time before all of us are drinking poisoned water and eating food supplied by poisoned water - including the 1% and their loved ones*. The only sane way forward, from my perspective, is to remove the divide between the 99% and the 1% and become one, or the 100%, living and working in harmony with each other, and with our environment. * perhaps the 1% is thinking no problem, they will just buy what little clean water and food there is left and to heck with the rest of us. My response: from whom will you buy this? A company that puts profit before everything, and is subject to no government regulation? (postscript Feb 4 2012). Thanks to Kyle Thompson for the pointer to the Economist article. Should we copyleft our personal information - including our bodies? Data mining is a growing trend, and we can soon expect to see demand for data mining more personal information than we have seen before, such as our personal health information. My question is, should we all collectively copyleft all of our personal information, including our bodies (DNA), so that anyone who finds a way to make useful services from our information, has an obligation to provide these services in a way that benefits us? For example, I submit that if a government or health organization authorizes the use of personal health data for research purposes leading to a commercial product, then the producer of that product has an obligation to make it available to those who provided the health information. This would not necessarily mean for free; it could mean reasonably affordable. Could an approach like this strengthen the position of social goods such as health care? This post is part of the Articulating the Commons series.